5 Bedroom Semi Detached House For Sale in Leicester for Offers Over £325,000. OPEN HOUSE EVENT 27th and 28th APRIL! CALL SPENCERS ON 0116 2889222 TO BOOK YOUR APPOINTMENT! 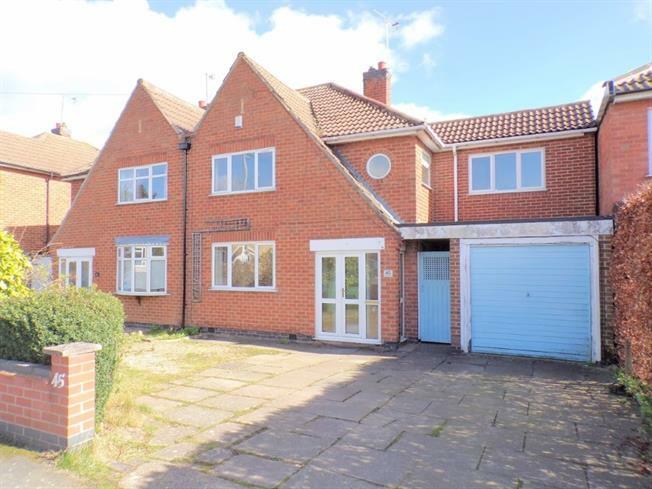 This extended five bedroom semi detached offers generous living space throughout and offers scope to further expansion (STPP). This excellent family home comprises of hall, through lounge diner, kitchen, utility room, ground floor WC, five bedrooms, bathroom, and integrated single garage. Other main features include gas central heating, double glazing, storm porch, pantry and neutral decoration. Externally there is a generous laid to lawn rear garden. The front has a driveway, low maintenance garden and a low perimeter wall. Desirable schools, local amenities, travel links and shops are all within easy reach. Viewing advised. No chain.